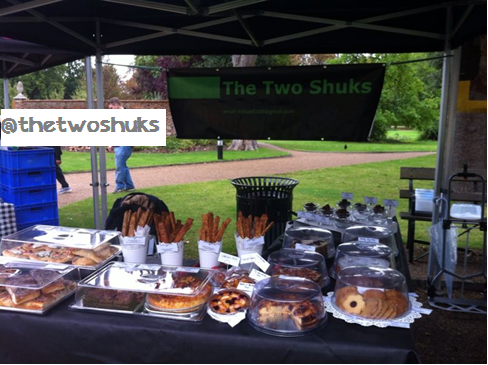 Everyone loves cakes and all sort of baked goods and the Two Shuks (@thetwoshuks) have a cake stall that is in different markets around London. They make a variety of lovely yummy sweet goodness as well as other baked goods and my favourites of theirs, their bread sticks! They also make freshly baked Jammie dodgers!! It is huge! And tastes better than the processed ones from the supermarket because it so fresh and I don’t think it has any preservatives yay!! The bread sticks, I tried 3 different flavours, cumin, chilli, onion and cheese and all of them were bursting with flavour. The cumin was my favourite but only because I love cumin all my food ha-ha!! You could have the tiniest bite of any of the flavours and you’ll instantly know what it is, that’s how good they are! All the food is made and baked freshly by them, not like when you buy something from a supermarket and it just says baked in stored which really isn't the same thing. There is a significant taste difference, trust me. Not only this but the portions are so generous and the prices are highly competitive especially as they are located in London where food outlets tend it over price. But the Two Shuks are very reasonably priced and much cheaper than other companies that bake fresh.